Here's a another low mile Corvette just in at Unique Speciatly and Classics! Yes, that's right only 7,612 miles, I might put a couple more miles on it driving around the parking lot listening to ponies under the hood and smiling. This one isn't like the 99 Vette parked in the garage down the street at your neighbors place. You could say this one has been "massaged" a little to raise the performance. This particular car was sold at Courtesy Chevrolet in Phoenix AZ and was titled with the first owner in Tucson Az where it spent the majority of it's life. During that time he decided to up the performance of this beautiful black convertible and had it sent to renowned engine builder Doug Rippie of Doug Rippie Motorsports. That's where the "massaging" started, the cylinder heads were ported, performance valve train, Doug Rippie custom hydraulic roller camshaft, forged-steel stroker crankshaft, ultra-light billet connecting rods, forged pistons, rotating assembly balanced and blueprinted, modified intake system, fuel injector upgrade, Centerforce dual friction clutch assembly, heavy duty aluminum radiator with integral oil cooler and then Chassis dynoed with computer recalibration! As, you can see it's not just a bunch of bolt ons, this LS1 one was built by a pro and to the tune of $15,500! While it was there a Ripper Shifter was added which is an unbelievably short throw 6 speed shifter that is a dream to use in this car. The original owner didn't stop there though, a set of BBS LM design two-piece forged wheels were installed which are top of the line. Passport radar detector has been installed which might come in handy if you know what I'm saying. Last but not least B & B fabrication installed headers and a "cat back" muffler system that adds another 15hp but does it with a tasteful throaty sound nothing obnoxious. 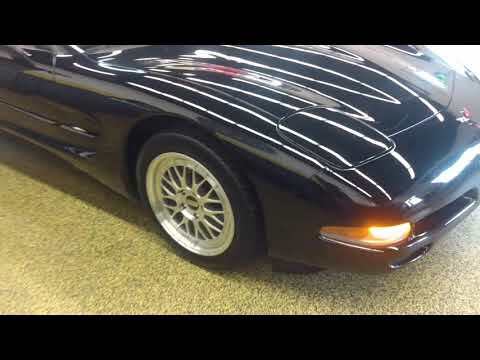 So, with the engine build 490hp and the 15p gain from exhaust you looking at 505hp C5 Vette that has been adult owned, never tracked, and well maintained with 7,612 miles on it.